‘Ever wonder if God is really there? You pray and there’s silence. Sometimes, it seems a prayer goes unanswered. Other times, the answer isn’t what was expected. Am I the only one who asks God for help and proceeds to tell the Creator of the universe exactly how to answer? Recently, God provided precisely what I requested. A winter storm hit our area. Meteorologists predicted sizable snow accumulations and blustery winds. Those forecasts didn’t deter Chris from his plans. Before the first snowflake, our son headed out to a bowling alley seven miles away. His intention: to walk home. Chris proceeded to leave, carrying a huge backpack. Howie didn’t repeat the offer. No point disputing Chris’s decision. Arguing with someone who has mental illness (MI) isn’t a good idea…reasoning with him isn’t usually possible. Although rejecting the assistance made no sense, Chris’s mind was set. At nightfall, the storm arrived with a vengeance. Gusts of wind created white-out conditions. I couldn’t get the image of Chris out of my mind. 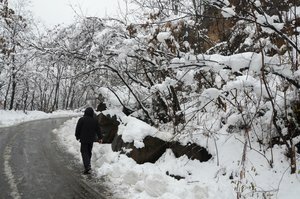 I pictured him trudging alone, in the dark, on the side of a snow-covered road. Thoughts of cars creeping by on slick surfaces tormented me. Will drivers see him in the dark? What if a car spins out of control right next to him? I calculated how long it would take to walk seven miles in good weather. Two hours, at least. But, battling defensive linebacker- strength winds could make it much longer. The journey could take close to four hours. “Howie, please pray for someone to offer Chris a ride home.” With bowed heads, we lifted up our hearts. Will I hear the front door open or the phone ring? Finally, at 2:45 AM the door opened, telling me Chris returned home safely. The next day, Chris told Howie someone at the bowling alley offered him a ride. He turned it down. Where was God when Chris rejected the second offer? He was providing His answer to our specific prayer: for someone to offer Chris a ride. Surely, God knew we meant that we wanted our son to be spared the ice-cold trek home. But, God demonstrated His ever-present care for our son. He moved in the heart of the person at the bowling alley. He honored Chris’s free will. And protected Chris as he trudged home in a storm. We head into the storm, rejecting God’s assistance. Our Father knows how my husband felt when Chris declined his offer. He knows what it’s like to watch us as we struggle needlessly on our own. God promised Moses and Joshua He’d be with them. With that promise, Joshua was able to assure his people. When you face a river of uncertainty, can you hear the words God spoke to Joshua? The Lord your God goes with you. Do you hear Him beckoning you to walk with Him? Will you stagger alone, or stroll with your Lord? Does it feel like your life needs a complete make-over? Perhaps, you feel like God has gutted your family. Each day requires maneuvering around construction cones that detour you from your destination: to survive the day without any turmoil. You wonder what God’s doing? In the face of inevitable defeat, Jeremiah followed God’s command. Jeremiah understood the sin of God’s people. He knew God’s ability to turn the hearts of His people back to Him. God gave His best: the Promised Land. The Israelites responded with their worst: turning to other gods. He restored His best: He drew them back to Himself, giving them a singleness of heart to worship only Him. Can we, like Jeremiah, trust that nothing is too hard for God? (Jeremiah 32:17) Our loving Father knows how to make things right. He is able to work in the heart and minds of our loved ones. But, make-overs aren’t always easy. Last year, the pipes above our kitchen were cracked. At any moment they’d break and flood the kitchen. Something had to be done. Should we pay for a complete make-over? Or, could we choose the less expensive route and have it fixed? Fixing it up, thought cheaper, seemed impossible. A complete renovation was needed. It was tough being banished from our kitchen for four weeks. First, we had to box up all our pots, pans, dishes, and glasses. Next, came the painting…. But, it was worth it. 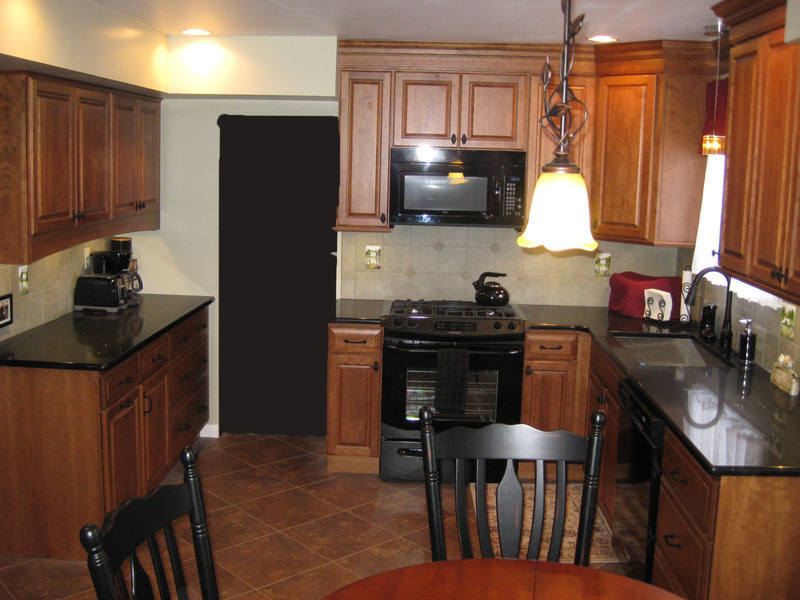 A thorough overhaul resulted in a warm and inviting room. One where we love to eat and entertain guests. We enjoy spending time there each day. We didn’t enjoy the renovation, but it was necessary. 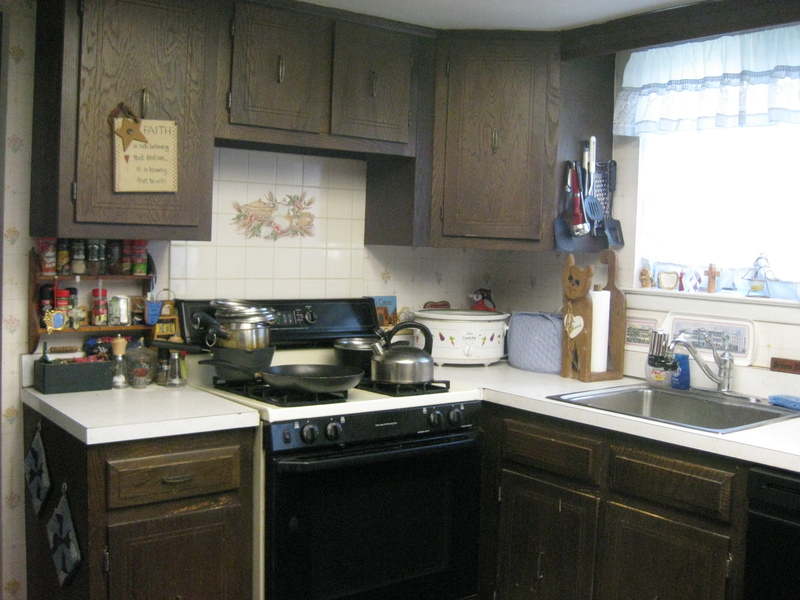 Our kitchen is a constant symbol of a loving Father’s mighty work. God moves powerfully in our situations. We can endure divine and temporary demolition. Knowing He is rebuilding lives and restoring relationships. In the process, He draws us to Himself. Rest assured, God’s best is being crafted. Our best is to trust He will complete that work. Does it help when people attend the funeral of a loved one? 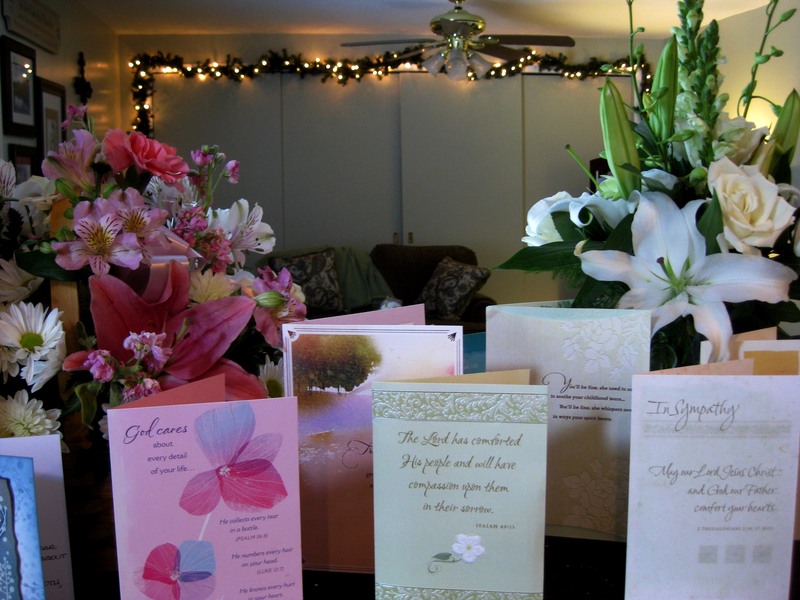 Do sympathy cards make a difference? My husband and I were comforted by all the people who came to my mother-in-law’s funeral. It’s amazing how much cards and flowers softened my grief. The prayers and sympathy meant so much. Because of who sent them. Sorrow was soothed by friends who care. Each gesture brought some relief from my hurt. I reread the sympathy cards and blessings swelled my heart. How I cherish the relationships I have with godly women! Ladies I call friends. A friend stands by us when times are hard. No words are needed. Just their presence says, “I’m here for you.” Pain dissolves at their gentle touch and warm hug. Shared tears let us know their heart weeps with ours. Who stands by our children who have mental illness (MI)? Few people want to be around someone who is depressed. Many don’t know how to handle someone else’s anxiety. A mother’s care is constant. She reaches out to her son when emotional pain engulfs his heart. Sometimes, he welcomes her listening ear. Other times, he recoils at the sight of her open arms. That’s when her teen would prefer a friend. A faithful companion who would console him. Some individuals with MI are blessed to have a good friend. Others aren’t so fortunate. It’s hard for a mom to watch the isolation and loneliness. It’s difficult to hear some of the unkind names used when people refer to a person with serious MI. Who will call our children “friend”? Jesus. We can count on Him to see the person, not just the MI. In the Garden of Gethsemane, Jesus called Judas, His betrayer, “friend” (Matthew 26:48-50). Satan had entered Judas (Luke 22:3). Yet, Christ’s perspective was on the person. God knows our need for friends. “The Lord would speak to Moses face to face, as one speaks to a friend” (Exodus 33:11). Abraham was called God’s friend (James 2:23 and Isaiah 41:8). Christ called His disciples friends (John 15:15. And He expressed His love for us when He said, “Greater love has no one than this: to lay down one’s life for one’s friends” (John 15:13). He demonstrated that love for us on the cross (1 John 3:16). We can count on Him to be our child’s true Friend. Please send godly friends into my son’s life. Thank You for your ultimate expression of friendship when You willingly died for my sin. Praise You for blessing me with women who weep with me. Help me be a faithful friend to those You have placed in my life. Let the words to this song “What a Friend We Have in Jesus” minister to you. Last week when our traveling vet came to put our dog down, my husband stayed with our pet to the end. I couldn’t watch. I went upstairs and began praying for my husband. He would miss our dog, the most favorite pet he ever had. Our beloved cocker spaniel “watched” football with my husband on the recliner. There would be no long ears to pet while at the computer. No helper to prewash the dishes for the dishwasher. No dog to accompany him as Howie brought in the shopping bags. I couldn’t ease his pain, while mourning our loss myself. No words could spare him the grief. 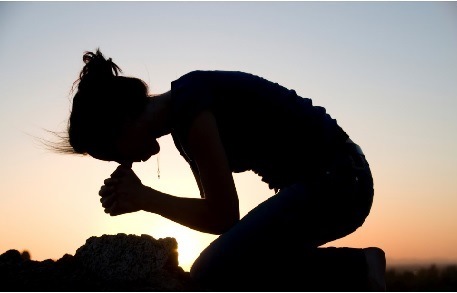 So, I knelt to pray…an unusual position for me since I have multiple sclerosis (MS). I cried out to God. Howie knows that many people pray on their knees. He understood the position of my conversation with God meant I spoke from my gut…from the core of my being. His long embrace told me how much that intercessory prayer meant to him. Deep pain and urgency drives a person to cry out to God. Our human limitations lead to desperation. Sooner or later, everyone gets desperate. Heartfelt prayers are sent to God. The fox hole prayer of a soldier, the surrendering prayer of an addict, the negotiation prayer of an unfaithful husband, the deathbed prayer of a terminally ill patient…or the pleading petition of a mom. Mothers nurture and help their children. We’re driven to heal the hurts. But, sometimes those hurts can’t be cured with a band aid or a kiss. Like when a child is distraught or depressed. Or when a son is tormented by anxiety or distorted thoughts. A mom of a child with serious mental illness (MI) watches such pain. We’d rather take the pain ourselves than have our children suffer. In helplessness, we cry out to God. When you cry out to God, do you fast? Do you ask the Holy Spirit to pray for you? Do you sob or scream the words? Hagar’s story encourages those of us who can’t stand to see our kids suffer. “Early the next morning Abraham took some food and a skin of water and gave them to Hagar. He set them on her shoulders and then sent her off with the boy. She went on her way and wandered in the Desert of Beersheba. When the water in the skin was gone, she put the boy under one of the bushes. Then she went off and sat down about a bowshot away, for she thought, ‘I cannot watch the boy die.’ And as she sat there, she began to sob. Our heavenly Father can do what we can’t…with greater love and power. Listen to this song that reminds you He sees each tear that falls and hears when you call out to Him.